Avicenna (/ˌævɨˈsɛnə/; Latinate form of Ibn-Sīnā (Persian: پور سینا / ابن سینا‎‎‍; Arabic: ابن سینا‎‍), full name Abū ʿAlī al-Ḥusayn ibn ʿAbd Allāh ibn Al-Hasan ibn Ali ibn Sīnā (Arabic: أبو علي الحسين ابن عبد الله ابن سينا‍; c. 980 – June 1037) was a Persian polymath and jurist who is regarded as one of the most significant thinkers and writers of the Islamic Golden Age.Of the 450 works he is known to have written, around 240 have survived, including 150 on philosophy and 40 on medicine.His most famous works are The Book of Healing – a philosophical and scientific encyclopedia, and The Canon of Medicine – a medical encyclopedia. which became a standard medical text at many medieval universities and remained in use as late as 1650. 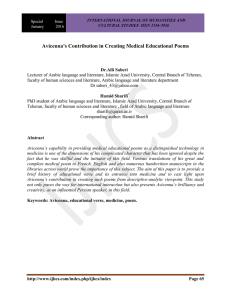 In 1973, Avicenna's Canon Of Medicine was reprinted in New York.Besides philosophy and medicine, Avicenna's corpus includes writings on astronomy, alchemy, geography and geology, psychology, Islamic theology, logic, mathematics, physics and poetry.